Playing softball or baseball can easily become one of the most important parts of a child’s life. It will teach them many valuable lessons about life and prepare them to enter the world of work. Many children who grow up without an experience to compete healthily will have problems later in life when dealing with losses and understanding the correct way to celebrate victories. Sport teaches a player the importance of teamwork, which will be useful to understand in their future careers and personal relationships. Also, if you dedicate enough time and effort in the game, then it could possibly become a whole career and become a full-time gig. Softball and baseball are wonderful activations that also promote a healthy body through cardiovascular exercise. With a rapid increase in today’s technological advances, it is increasingly common to see young people replacing healthy exercise with computer games and television shows. Would not it be great if there was an alternative that offered social interaction along with a good exercise? That is exactly what baseball and softball do for children, it provides an exciting and fun game to play that provides an excellent outdoor activity full of vigorous exercise. At the headquarters of DOM Dugout Manager, we love to promote and help this abundant sport creating wonderful products to help coaches and players have an incredible experience playing the game. Our main product is the dugout organizer. Essentially, what the coverage manager offers players is a useful tool to securely store your equipment with hooks, a support and a rack. Without a dugout organizer, the dugout quickly becomes a disorganized and confusing place that creates a bad experience and environment for players and coaches who have to dig a lot of supplies. Not only is it annoying for players, but having a poorly managed dugout creates a general bad practice that will delay the game while players look for their bat or gloves. The use of our softball or baseball organizer makes it an excellent solution to keep all the player’s bats, gloves, helmets and other accessories in the same place; It’s even a great cup holder! The way it works is that it uses a hanger with which you can easily accumulate all your equipment to keep them separate from the other players. 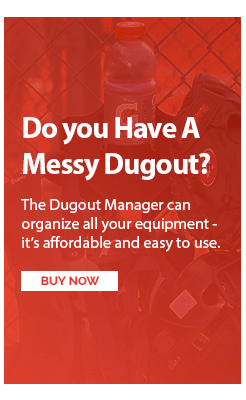 Find out now why many baseball and softball teams love the DOM dugout organizer!